For my personal block/quilt design challenge, I chose Aunt Sukey’s Choice quilt block this week. It is drawn with a 6 x 6 grid. I usually challenge myself to add/delete lines to a block to come up with alternate blocks, and then use these blocks, along with the original block, to design quilts. I got distracted by SewCalGal’s red and white challenge. In Phase II, we are challenged to design a red and white quilt. 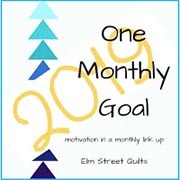 If we want to actually make the quilt, then Phase III is available for us to enter. The blocks in the following design do not include the original Aunt Sukey’s Choice block, but two variations that I drew from it. The quilt size is 84.5″ x 96.5″. Electric Quilt (my quilt design software of choice) even gives the yardage requirements! If I were to make this design, I don’t know that I would stick to just three fabrics. As long as I keep the importance of value/contrast in mind, I could make this a scrappy red and white quilt. I’m going to link up with SewCalGal! How about you? Are you taking the red and white challenge? The November Free Motion Quilt Challenge at SewCalGal is a tutorial from the very talented designer and teacher, Sarah Vedeler. Sarah had us practicing spirals this month. She made it easy by establishing a grid on paper. The boundaries really helped me to establish a rhythm in drawing the spirals. For my practice piece, I used hand-dyed fabric scraps, an almost empty spool of Coats & Clark for the top thread, and an assortment of almost empty bobbins with Aurifil 50 weight threads. I loosened my top tension a bit. And, yes, I use practice pieces to use up odd bits and pieces unless I have an end result in mind and I really need to know how the materials are going to play together. I drew a grid on the fabric with a blue washout marker. On this piece, I free-motion stitched a tree with 30 weight variegated cotton thread. I should have chosen a different color; then maybe the stitching would have shown better. I’m calling it “The Ghost Tree” since you can’t see it. Sigh. It will help if you click on the photos for a closer look. The background is filled with free-motion swirls made from 100 weight polyester. No grid. Funny…after stitching all of those swirls on a grid, I had a hard time deliberately stitching swirls that are not evenly sized and spaced. I didn’t want the swirls the same in my background. The tree is not flat, but that’s hard to photograph too.